THE GOG BLOG by Rory Spears. Editor and Director of Content. Follow Rory to the Ryder Cup, and on Facebook, Linkedin and Twitter @GogBlogGuy. DAY 1 Team USA 5-Team Europe 3. It was quite a start for team USA, and during the Ryder Cup of recent years, Foursomes have not been the teams strongest suit. That changed today when the USA swept Europe 4-0 in the morning matches. Jordan Spieth and Patrick Reed were first out and set the tone with a birdie on the 1st hole. They never looked back in a 3&2 win over Olympic medal winners Henrik Stenson and Justin Rose. The anchor match saw Dustin Johnson and Matt Kuchar crush Lee Westwood and Thomas Pieters 5&4, a match that was over early. The first hole area has been buzzing for a few days. The middle matches looked to be European points most of the day, but Phil Mickelson and Rickie Fowler who were 1 DN after 15, won holes 16 and 17 for a 1 UP win over Rory McIlroy and Andy Sullivan. Then like on cue, Zach Johnson and Jimmy Walker won four straight holes on the back nine for a 4&2 win over Martin Kaymer and Sergio Garcia. the late flips on two matches and a 4-0 sweep had the Hazeltine pro-american crowd buzzing. “We expected it to be a good morning, but maybe not this good,” said Mickelson. Who added Team USA felt it could win the morning session. If only they could have kept it going. 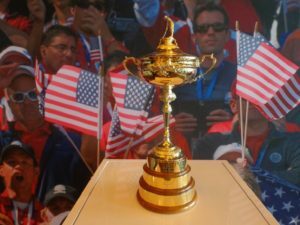 If the USA had an afternoon like the morning went, the Ryder Cup could have been back in USA hands by late on Saturday. It wasn’t to be. Europe started the afternoon like it started the morning in the Fourball matches. With Reed making a quick birdie on the 1st, and putting team USA 1 UP. But by the 7th hole the match had flipped and Stenson and Rose had revenge with a 3&2 win and Europe had it’s first point. The USA then regained it’s four-point lead when Brendt Snedeker and Brooks Koepka rolled to a 5&4 win over Martin Kaymer and Danny Willett. Willett the Masters Champion took some heat from the American galleries, still upset over negative comments made this week by Willett’s brother about american golf fans. The Europe won the last two matches when Garcia and Rafa Cabrera-Bello won 3&2 over J.B. Holmes and Ryan Moore, who were both playing their first match of the day. Then McIlroy rolled in a big putt he said later he knew was going in before he hit it, and celebrated with fist pump and bow to the gallery after he and partner Thomas Pieters defeated Johnson and Kuchar 3&2. There are some interesting changes for the Saturday morning Foursome matches. Matt Fitzpatrick who spent a short time at Northwestern University will get his first action of the matches for team Europe. Both captains Europe’s Darren Clarke and Team USA’s Davis Love III, felt very positive about their teams after Day 1. Click here to hear interviews with Brandt Snedeker, Brooks Koepka, Rory McIlroy, Thomas Pieters, Darren Clarke and Davis Love III. Full coverage of the Ryder Cup continues here on Day 2 from Hazeltine National GC. THE GOG BLOG by Rory Spears, Editor and Director of Content. 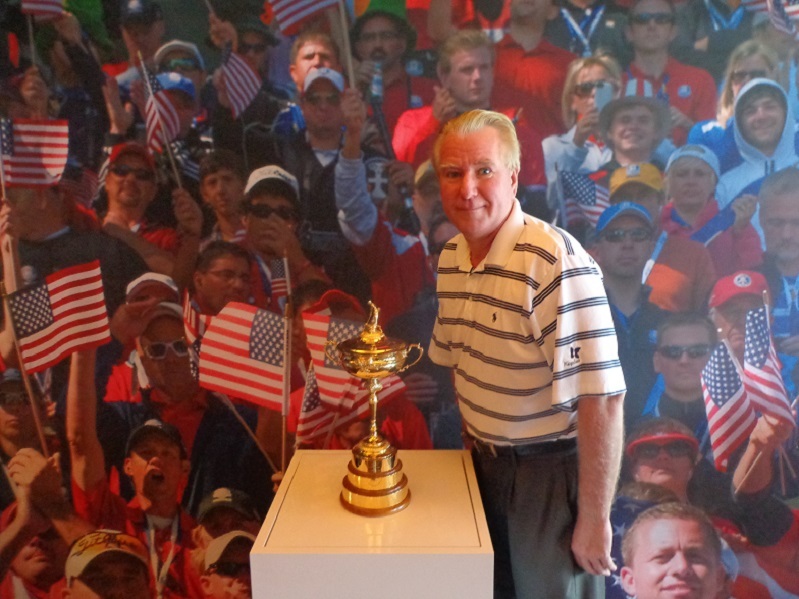 Follow Rory to the Ryder Cup and on Facebook, Linkedin and Twitter @GogBlogGuy. The 41st Ryder Cup is finally ready to tee off starting at 7:35 CST from the Hazeltine National Golf Club in Chaska Minnesota. On Thursday the opening ceremonies were held and both teams got their final practices in. The weather was better today and sun was out most of the day, so teams were able to practice without so much cold weather gear on. The galleries were extremely large and it was a sign of how many people are expected to be in attendance. The Captains Davis Love III of Team USA and Darren Clarke both held their final press conferences after the opening ceremonies. In what Team USA hopes is not a sign of things to come, the 9-hole matches between former team captains of both sides, was a sweep for the European’s by a score of 8-0. Jordan Spieth and caddie Zach Grellar check messages on the putting green. 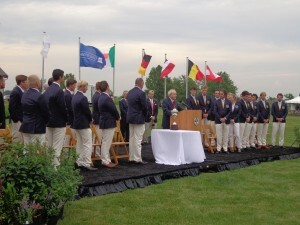 At the end of the opening ceremonies, both captains revealed the four teams they will send out starting at 7:35 Friday morning in the foursome matches, or alternate shot style matches. Match 1. USA Jordan Spieth and Patrick Reed vs EUROPE Henrik Stenson and Justin Rose. Match 2. USA Phil Mickelson and Rickie Fowler vs EUROPE Rory McIlroy and Andy Sullivan. 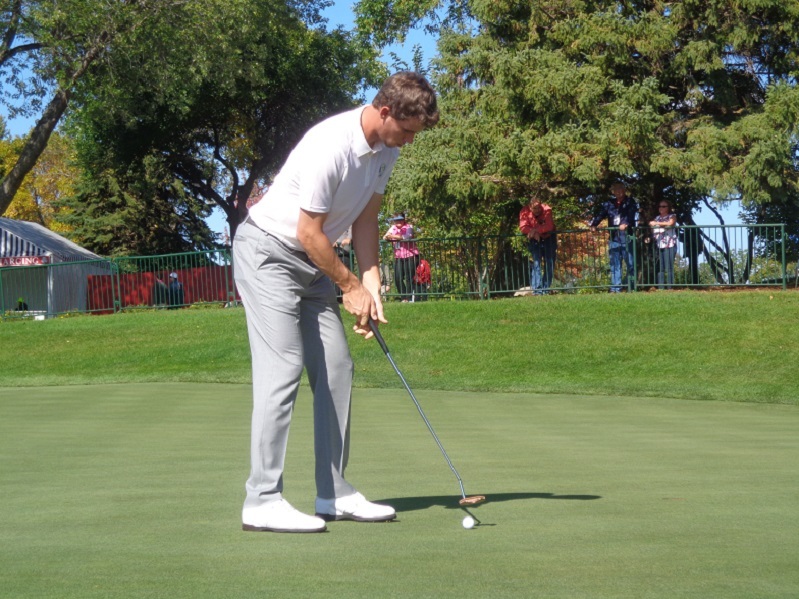 Thomas Pieters of Team Europe and formerly of the University of Illinois, practice putts before the start of the Ryder Cup matches. Match 3. USA Jimmy Walker and Zach Johnson vs EUROPE Sergio Garcia and Martin Kaymer. Math 4. USA Dustin Johnson and Matt Kuchar vs Lee Westwood and Thomas Pieters. Both captains were non-committal on afternoon pairings, and said they would see how the morning went first, but even Love III didn’t say much on that issue either. The second match starts at 7:50 Am, Match 3 at 8:05 Am, Match 4 at 8:20 Am. The USA needs 14 1/2 points to take back the cup and Europe needs only 14 points to retain the cup. Click here to hear Team USA Captain Davis Love III press conference along with a few comments from team Europe Captain Darren Clarke. 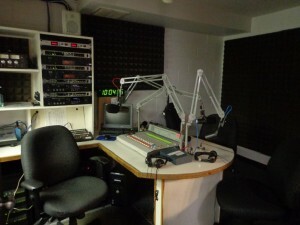 Weather for Friday, sunny all day and temperature high of 71 degrees. THE GOG BLOG by Rory Spears, Editor and Director of Content. 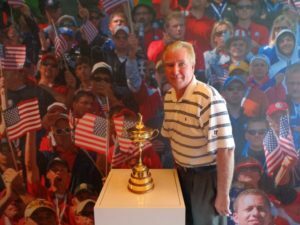 Follow Rory to the Ryder Cup and on Facebook, Linkedin and Twitter at Gog Blog Guy. 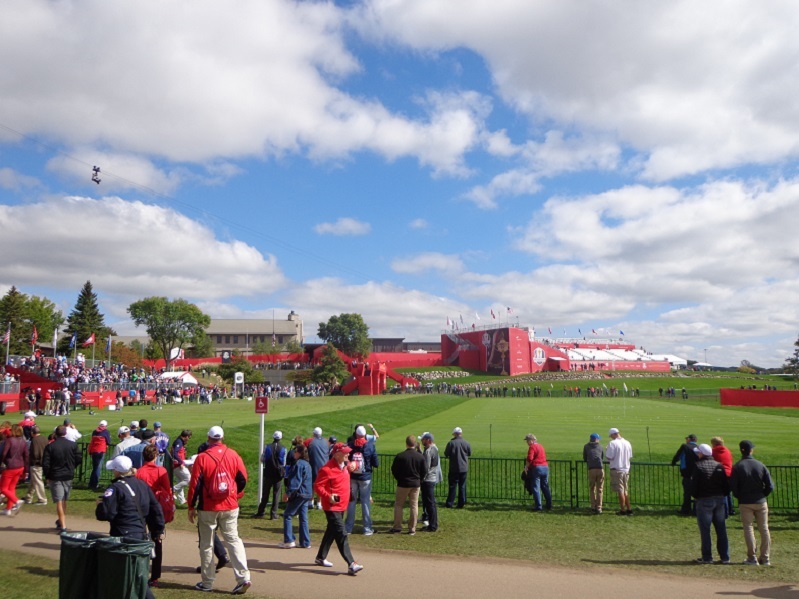 The 41st Ryder Cup is here, and the Hazeltine National Golf Club is buzzing with fans and it’s only Wednesday. The galleries will be huge and the emotion in the air. Team USA Captain and Phil Mickelson have already said the sqaud will be playing with heavy hearts after the passing of the “King” Arnold Palmer. Flags outside the clubhouse are at half staff in Palmer’s memory. 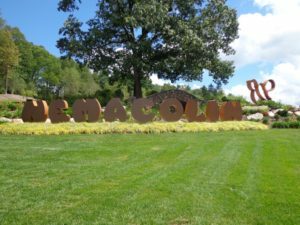 For Team USA, Hazeltine is the coming out party of it’s new game plan to win the back the Ryder Cup, that it has not won since 2008 at Valhalla. For the European’s they are looking for their 4th straight win int he Ryder Cup, but Captain Darren Clarke has six rookies on his team and veteran Henrik Stenson the “Open Champion” is playing on a sore knee that will require surgery in the days ahead. John Deere Classic Champion Ryan Moore was the late addition to Team USA after a second place finish at East Lake in the PGA Tour Championship, that was won by Rory McIlroy who says he is ready for this week and excited about his game. All three of the medalists at the RIO Olympic Games are here as well. Justin Rose who won the Gold Medal, Stenson with the Silver Medal and Team USA’s Matt Kuchar who won the Bronze. Mickelson was one of the many players who spoke today, but really captured the house with his comments about the Team USA plan to win, saying the USA can win and for his comments about the great fans in Minnesota and thoughts on Arnold Palmer. What else is making news. Danny Willett the Masters Champion has had to deal with questions about comments made by his brother that ripped american’s and the american golf fans. Willett had to be confronted on the golf course by Captain Darren Clarke about his brothers comments. Willett released a statement and thanked american’s who have really supported him since he won the “green jacket”. Willett said he spoke with his brother as well and then USA Captain Davis Love III, who accepted Willett’s explanation. Arnold Palmer at Bay Hill back in it’s early days, Bay Hill Lodge and Resort home of the Mastercard Championship. Palmer passed away earlier today at Age 87. 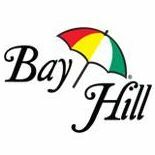 ARNOLD PALMER’S last Pre-Tourney press conference at Bay Hill prior to the championship, March of 2015. Arnold Palmer “The King” has passed away at Age 87, details are unfolding. 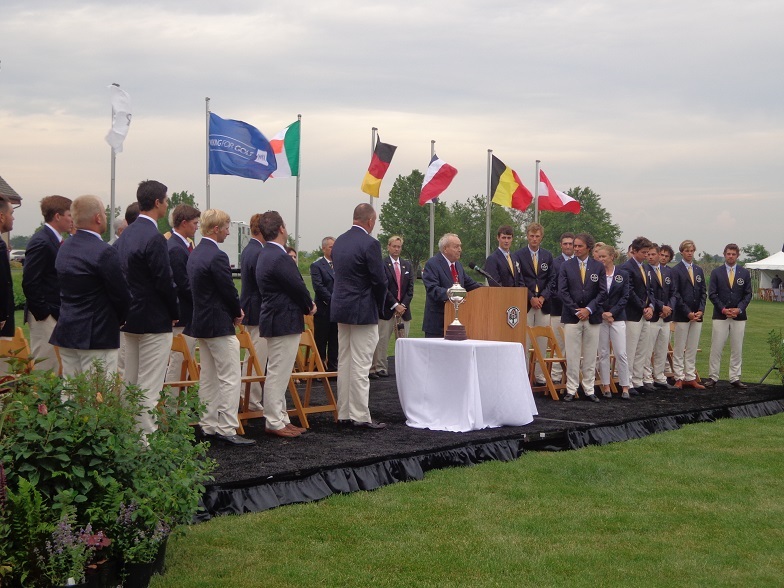 Arnold Palmer speaks before the Palmer Cup at Rich Harvest Farms in June of 2015. Jerry Rich owner of Rich Harvest Farms on Palmer’s passing. Arnold Palmer was a special person, not only a golf icon, but special person off of it as well. There are plenty of people today who know how to act and what to say, because that how Arnie would have done it. You take your hat off inside of a building, men hold the door open for lady, it’s simple stuff like manners that’s all. There are plenty of sports figures, athletes, and folks in the public eye who have made millions in the world of corporate endorsements, well they can thank Arnold Palmer who made a living at it long before anyone else did. These days it’s not uncommon to go into your favorite golf club or watering hole and order an Arnold Palmer, who ever thought that a mix or Lemonade and Iced Tea would become such a popular drink, well it did and maybe because it’s known as an Arnold Palmer. Palmer wasn’t dealing with the heat well over the last week or two, so he was taken into the University of Pittsburgh Medical Center (The UPMC). It’s not clear yet what the doctors there discovered, but Palmer was due for a heart operation on Monday. I had the privilege of meeting and talking with Palmer on several occasions and I will never forget them. One year in the early 90’s Palmer golfed with Michael Jordan at Stonebridge Country Club in Aurora during the Ameritech Senior Open. Around 18,000 people showed up for a pro-am, that alone is amazing. After the round both Palmer and Jordan had press conferences, when Palmer was done Jordan started his, long time Chicago reporter Jerry Kuc and I sat with Palmer as Jordan talked about the day. 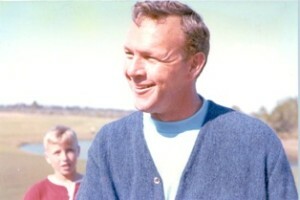 I’ll never forget Kuc asking Palmer if Jordan had a chance to be a pro golfer one day, Palmer smiled and shook his no. We knew right then MJ had better stick to hoops. 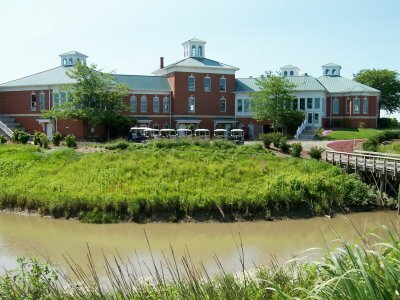 During the 1997 Sr. Open at Olympia Fields, Palmer upset with his putting during Round 3, came over to a small putting green on the backside of the Olympia Fields clubhouse. Kuc again was the first to notice him and stopped to watch, soon came your’s truly and then others, and more and more. The green was surrounded, 1-deep then 2-deep, then 3-deep. Arnie’s Army around the putting green was bigger than the gallery following the leader, it’s stuff like that you don’t forget. I remember interviewing Palmer at Kemper Lakes in 1989 at the PGA, 1988 at the Sr. Open at Medinah. You don’t forget those moments. I do remember a 1997 U.S. Sr. Open hat I had Jack Nicklaus and Arnold Palmer autograph, it raised a lot of money at a golf outing for Children’s Memorial Hospital in Chicago. 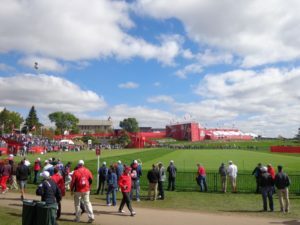 As I head to Hazeltine for the Ryder Cup this week, I can only imagine the atmosphere that will be there. Win one for the King, well at least it should be. Let’s hope they do. Golfers on Golf Radio is done for 2016, but looks forward to returning in 2017. Meanwhile the Golfersongolf.com rolls on all year long. Dateline Casey, Illinois. The small Illinois town of Casey continues to make the Guinness World Book of Records. 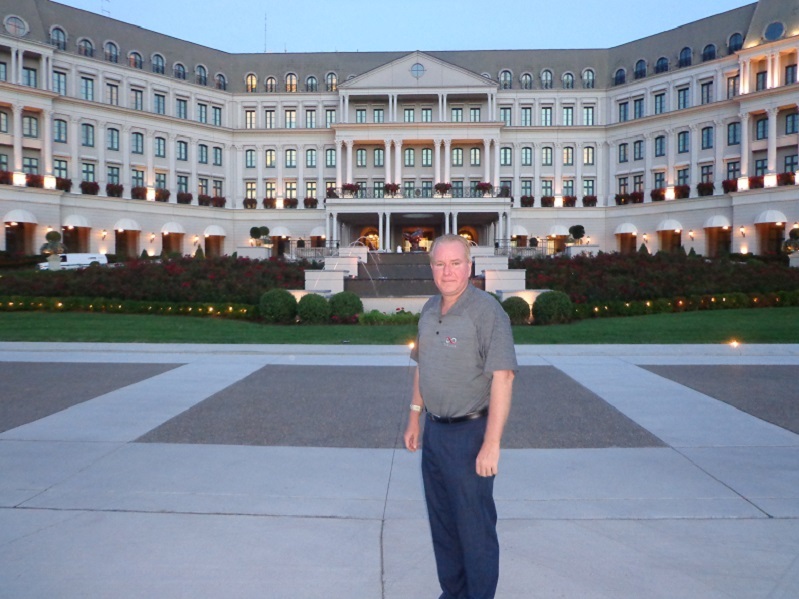 Jim Bolin of Bolin Enterprises in Casey and his team have set several records, the most famous golf record is the building and design of the World’s Largest Golf Tee. In the last couple of weeks a new book by the folks at Guinness have featured those who are the main record breakers around the world. Bolin is among them. Meet The Record Breakers is now in the stores, find your copy at your favorite place to buy books, perhaps Bolin and his team could build the world’s largest golf ball, golf club or even golf course, lets hope they do. LET’S GOLF ALL DAY & ALL NIGHT are your ready for Night Golf. There is now the belief that golf doesn’t just have to be played during the day time. Raise the money, raise the revenue, for more on how to make your facility Night Golf friendly, or to get the new LED Golf balls contact Phil Immordino, President of NGTA (Night Golf Tournament Association) and see ngtaa.com or call (602)-524-7034. 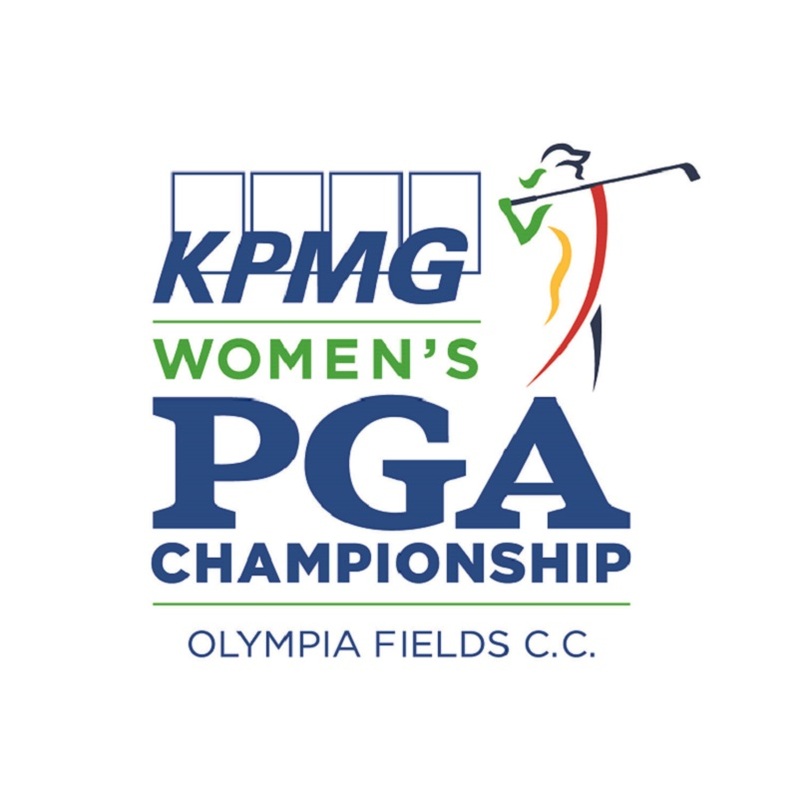 The 2017 KPMG Women’s PGA Championship that will be contested from June 27-July 2 at the Olympia Fields Country Club, is now looking for volunteers for the championship. Adult volunteers ages 22 and older are required to work four shifts and contribute at least 16 hours in total. Junior volunteers ages 14-21 must work at least three shirts and contribute at least 12 hours. Shifts last between three and four hours. 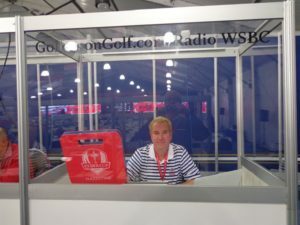 All volunteers do receive a uniform that consists of a golf shirt, outerwear piece, and headwear, a credential that allows for grounds access from Tuesday through Sunday. the volunteer fee is $130 for adult volunteers and no fee for junior volunteers. 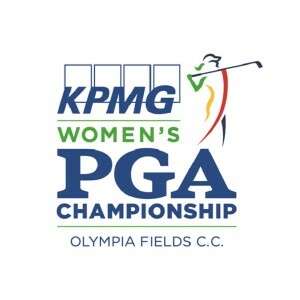 For more information see kpmgwomenspga.com/volunteer or you can contact the championship office at (708)-966-0370 or 2017WPGA@pgahq.com. 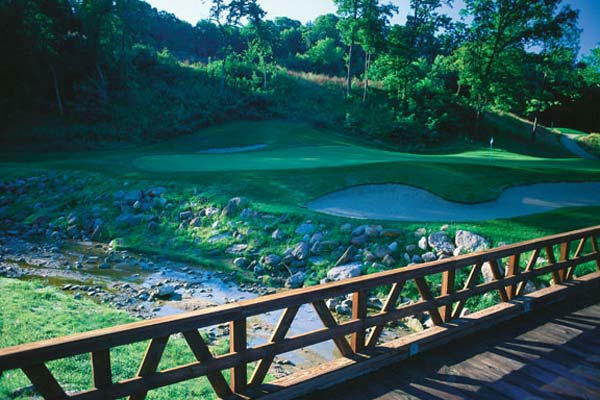 BIG CEDAR LODGE RESORT in Hollister/Branson Missouri is proud to announce that it’s Buffalo Ridge Springs Course has been named Best in State by Golf Magazine. 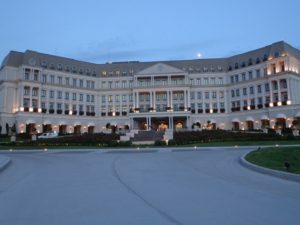 the former branson Creek Golf Club has made solid progress on and off the course since being purchased by Johnny Morris, CEO of bass Pro Shops and Big Cedar Lodge. For more information on Big Cedar Lodge see Bigcedar.com or call the golf shop at (417)-339-5430. THE GOG BLOG by Rory Spears, Editor and Director of Content. Follow Rory on Facebook, Linkedin and Twitter @GogBlogGuy. 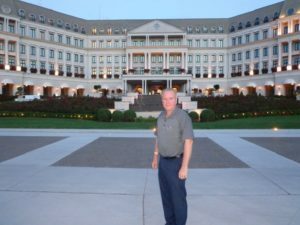 In front of the Chalet at the Nemacolin Woodlands Resort in Farmington PA. THE FINAL PICK of TEAM USA made by Captain Davis Love III will take place on NBC’s Sunday night Football at Halftime of the Game. Talk about a cross promotion, while there might not be much to see football wise by halftime, at least the pick might be interesting. Or it might not be, there are some in the golf world who already wonder what Love is doing with his picks. Is it the best players right now, who can putt. Or is it the guys in the boy’s club. We will see. Following the announcement, the PGA of America will put out an official release to the media, with comments from Love and player selected. For more information please visit RyderCup.com, or on social media @RyderCupUSA on Twitter or on Facebook or Instagram. The 10th hole at Weaver Ridge in Peoria. 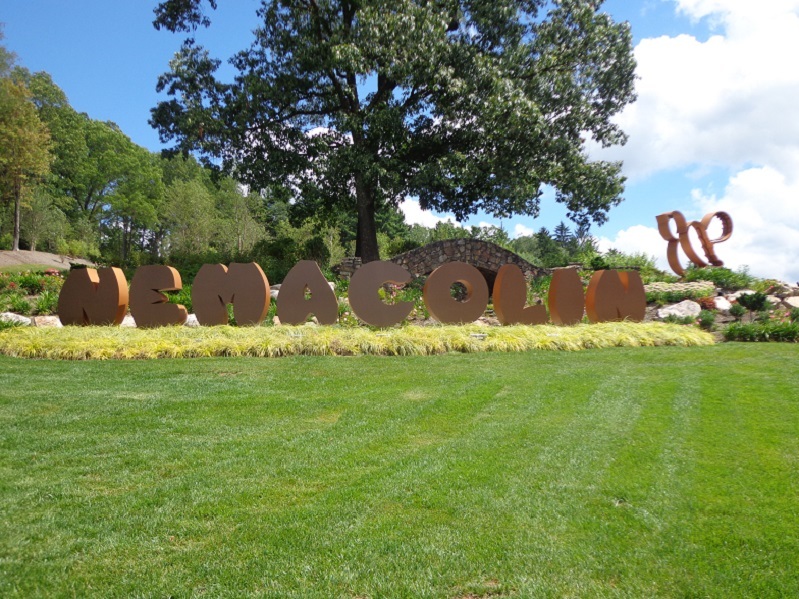 FOR SALE..once regarded as one of the hottest new properties in Illinois, the Weaver Ridge Golf Club of Peoria is now up for sale. This Hurdzan and Frey design sits in rolling hills and forest valleys. There are spectacular homes in the area’s off some of the golf holes. The clubhouse offers a fantastic banquet facility and serves some of the best food you will find in any 19th hole ( Awesome Quesadillas). For more information please contact Chris Charnas at Links Capital Advisors at (847)-866-7192 or via email at chris@linkscapitaladvisors.com or on twitter @linkscapital. They’re Out and in the pro shops as of now, the latest an greatest from custom putter designer Scotty Cameron. Cameron’s latest line of Titleist putters is called Cameron and Crown. They are shorter putters for those who need lengths of 33 inches instead of 35 or 36. You can get them in right handed or left handed designs and in different styles. 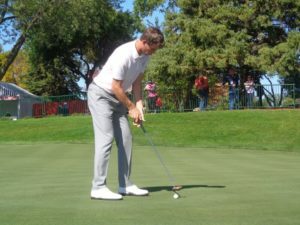 See Scottycameron.com or you can visit Titleist.com. Coming in October is the new Titleist Driver the 917 series. A full story right here will be coming soon. Stay clicked in for more details. THE GOG BLOG by Rory Spears, Editor and Director of Content. Follow Rory on Facebook, Linkedin and Twitter @GogBlogGuy. Wearing the Carnoustie Sportswear Line for Fall 2016. As much as we hate to think it, summer is leaving us. Yes as of tomorrow and by Thursday, Fall will be here. Fall is one of the best times of the year to play golf, the courses are not as crowded and the temperatures and the humidity are not as bad. The Fall colors look great as the leaves start to turn. There is nothing like walking those final holes as the sun starts to set a little earlier in the day. While you are playing your fall rounds why not do it in comfort and style. 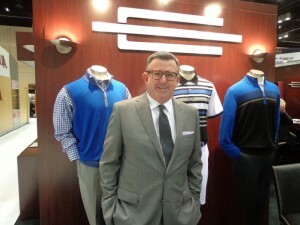 So make sure your fall wardrobe includes Sportswear and Golfwear from the Carnoustie Sportswear line. 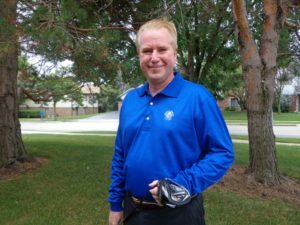 The Carnoustie Fall Sportwear Line, long sleeves and slacks that will make you look great on and off the golf course, play your fall rounds or enjoy the football season with some style and comfort. Mercerized Cotton Knits, Performance Knits, Cotton Suedes and The Mackenzie Collection of cotton outerwear. While other have fallen by the wayside Carnoustie continues it’s commitment to offer the finest in mercerized cotton. Carnoustie that has had a reputation for years in mercerized cotton knits, continues to use the same factories it has for more than 20 years. The buttons are still made of real pearl, with collars made from piles of yarn that contain Lycra for shape retention. While the trend is classic knit collars, Carnoustie features more of a self fabric collar than before and that gives the polo a new crisp look. The performance Knits collection continues to gain speed, the Carnoustie plan of designing a collection of performance knits that can merchandise with the mercerized cotton knits, leaves a respected collection. Performance knits gives Carnoustie a chance to adapt into the trends of today, and for the Fall of 2016 line, the features of chest stripes, color blocking, melange yarns and self fabric colors allow Carnoustie to offer for the first time long-sleeve style in five beautiful melange colors. Carnoustie long-sleeve polo offers a style and weight perfect to be a first layer as cooler conditions enter the fall-season. Cotton Suedes that have helped give Carnoustie a industry reputation for offering among the finest fleece for over 20 years, are now available in new colors along with jacquard patterns, and styles of retro full-zip jackets with front panels. THE MACKENZIE COLLECTION that was created just a few seasons back, is there because at times you need something a little lighter than the brushed fleece. This quickly growing in popularity collection has been expanded for 2016. The 1/4 zip vests and long-sleeve styles will become a centerpiece of all merchandise groups. New for 2016 also includes a full-zip jacket with a sporty flat knit detail that runs down the sleeve from the neck to the cuff. Now that you know how to be warm, comfortable, flexible and colorful in your fall line of outerwear, here is how you find Carnoustie. In Chicago area clubs like Ivanhoe, The Merit Club, Bull Valley, Rich Harvest Farms, Green Acres, Flossmore, Itaska and Lake Shore. Online it’s carnoustiesportwear.com and carnoustiesportswearonline.com. 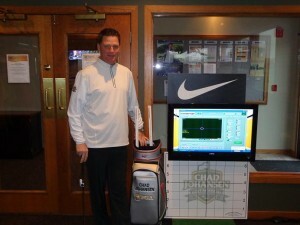 On social media at Facebook, Twitter.com CarnoustieSport. Instagram @carnoustiesportswear. Labor Day is behind us, and now summer soon will be as well. I know that some people think summer ends after Labor Day. But that is not entirely true. Summer actually ends a couple of weeks later, and that date actually pops up on the calendar this week. That being said the week ahead is expected to be in the 80’s, and will be great golf weather all week long. So get out and play while you have the chance, before we know it the weather will change and the snow flakes will be here, and we will be hitting in domes. THE TOUR CHAMPIONSHIP tee’s off this week in Atlanta, the final week of the playoff’s and one player is going to make a lot of money. Dustin Johnson has the point lead and win’s the Fed Ex Cup if he wins in Atlanta. Hopefully it’s a good tournament with an exciting finish. THE RYDER CUP then is on the tee box the following week, the Gog Blog is looking forward to being there, and providing some additional coverage. Stay clicked in for that. I AM really impressed with the start to the college golf season for the Fighting Illini, two tournaments and two wins for Mike Small’s team. It would be easy to call this year a rebuilding year for Illinois, but it looks like Small has reloaded and has his team rolling right out of the blocks. A come from behind win at Wolf Run, and going wire-to-wire at Olympia Fields was pretty good as well. Illinois had a 6 shot lead after Round 1, 21 shots after Round 2, and by Seven shots over # Oklahoma State after yesterday’s final round was complete. Illinois not only beat Oklahoma State, but six other ranked teams including #1 texas and #2 USC not bad. Junior Dylan Meyer lead Illinois with a 1 Under par score and Junior Nick Hardy shot even par. Freshman Brian Baumgarten who carded a 5 under par 65 in round one, was over par the rest of the way and ended up at +4. But still some solid play and maybe it will be Baumgarten who helps Illinois get down the road to Rich Harvest Farms next May. I’LL MAKE MY DEBUT at Cog Hill for 2016, which in itself is sad, it never takes me this long to get there, but looking forward to a nice outing and seeing what’s up with the Jemsek’s and at Cog Hill. Details to follow. Plenty of news in the week ahead, Carnoustie Fallwear, and a new Titleist Driver are among this weeks top highlights. Stay clicked in. RS. THE GOG BLOG by Rory Spears, Editor and Director of Content. Follow Rory on Facebook, Linkedin and Twitter @GogBlogGuy. 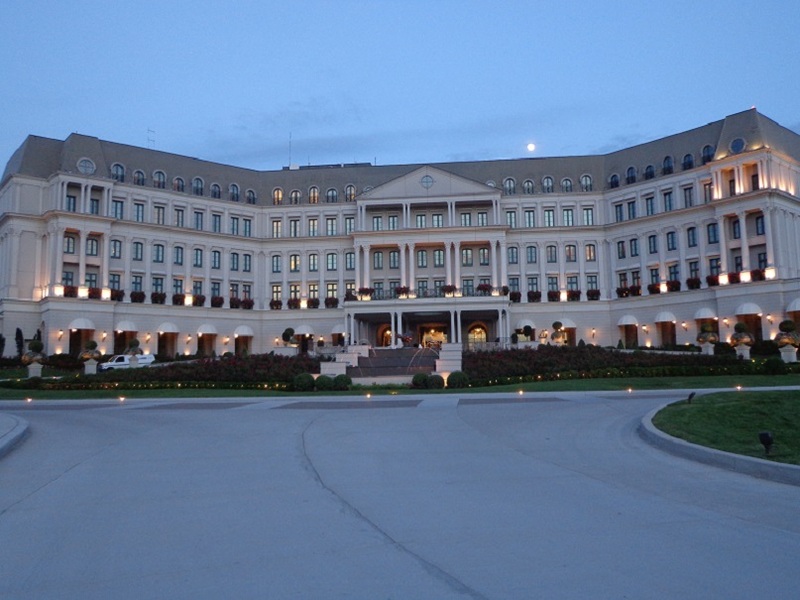 In front of the Chalet Hotel at the Nemacolin Woodlands Resort in Farmington PA. 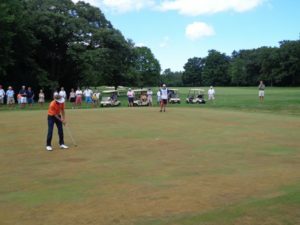 The University of Illinois has built it’s lead in the OFCC/Fighting Illini Golf Invitational to 21 shots as the tournament heads into it’s final day. The story of Day 2 was Junior Dylan Meyer who a shot a 3 under par 67 on the famed North Course to lead Illinois and help the build their commanding lead. Illinois is at 6 Under par for 36 holes and second place Texas A&M is at 15 over par. Oklahoma State at +17 is in third place. Bryan Baumgarten who opened Day 1 with a 65, shot 72 in Round 2. Illinois has three players in the top 4 spots, with Nick Hardy being the third player after a 71 in Round 2. 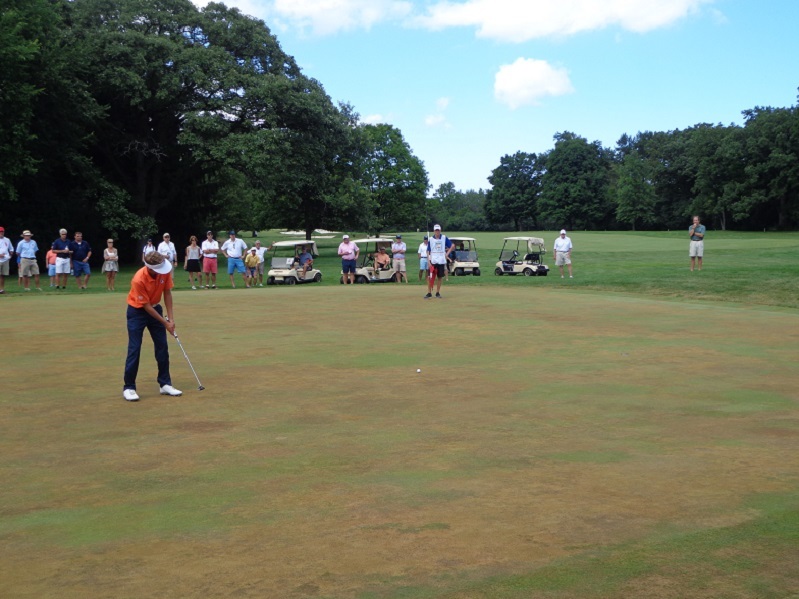 Dylan Meyer seen here during the Western Amateur continued his hot play at Olympia Fields. Meyer is tied for the lead with Cameron Champ of Texas A&M. The final round of the tournament is today at Olympia Fields, with Illinois tee-times starting at 8:45 am. Illinois is ranked No.3 in the country right now and seven other ranked are competing in the event. including #1 Texas and #2 USC. The Gog Blog by Rory Spears, Editor and Director of Content. Follow Rory on Facebook, Linkedin and Twitter @GogBlogGuy. 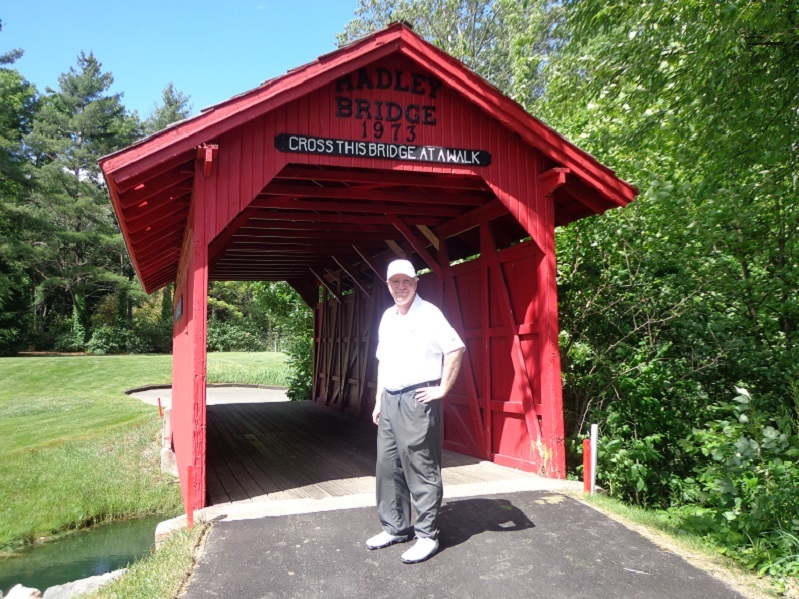 On the bridge at the 6th hole at Crooked Stick Golf Club. The BMW Championship is in the books for the 2016 golf season, Dustin Johnson walked off with the trophy and a lead in the Fed Ex Cup point standings. Johnson admitted to struggling with his irons a little, but heated up as the tournament went on. Once he got going even this strong field of 70 players could not keep up with him. The Top 30 coming out of Crooked Stick move on to Atlanta and the East Lake Golf Club and the Tour Championship, lets see who wins it should be a good championship next week, be sure to tune in. 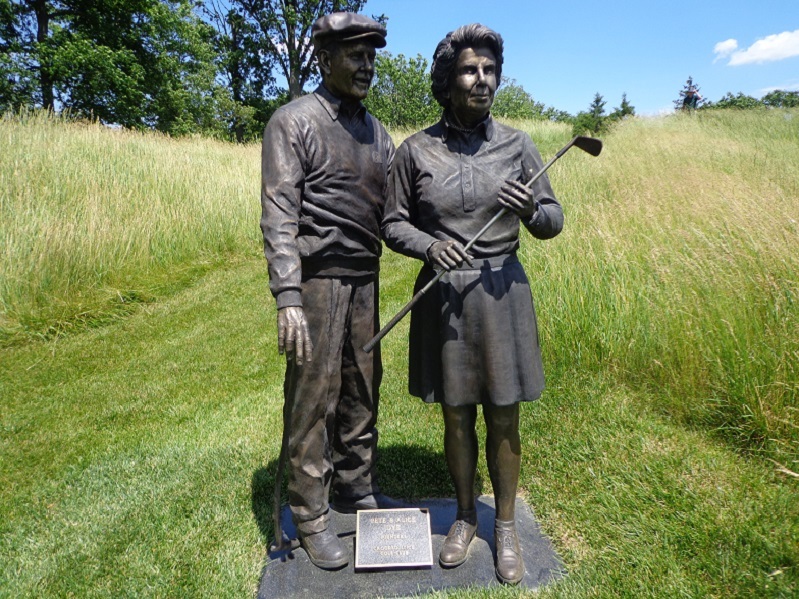 The Pete and Alice Dye statue behind the 18th green at Crooked Stick Golf Club. 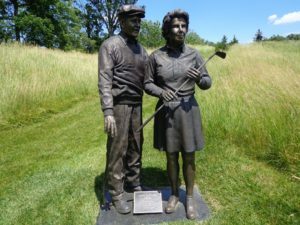 PETE DYE and his wife Alice were the chairman and or chairwoman of the championship. But unlike past events at Crooked Stick the Hall of Fame architect was not seen at the championship. 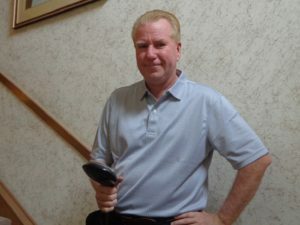 He was at his home off the 18th fairway, but the 90 year Dye has had health issues of late, and doesn’t have quite the memory that he once had. All of us who enjoy golf and Pete Dye courses around the country, are pulling for Pete to enjoy his time ahead the best way he can. In fact a new Dye Course will open later this month in the Indianapolis area, The Gog Blog will details on that in the days ahead. Stay clicked in. 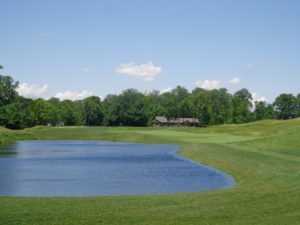 The new pond on 17 at Crooked Stick. The new pond on 17 didn’t have quite the effect some thought it might on the players, but in spite of rain the wind never was strong enough to serious effect on the top players in the game. But the rain did, some players play better and some don’t in the rain or after it. On more than one day there was Lift, Clean and Place rules in effect. I know there are media folks that love to call it “lift-clean&cheat” but it would have lead to some plugged balls and “squirrely shots” as Johnson saw it. RAIN and the BMW. Some years back former Western Open Championship Director Brian Fitzgerald used to say, “need rain schedule the Western Open”. Well the BMW has not fared much better in recent years. After seeing the downpour at Crooked Stick this year, that was almost as bad as what Crooked Stick had in 2012, what the championship had at Conway Farms in 2013 and 2015, the cold weather at Cog Hill two different years, and the rain at Bellerive it would be nice next year if the championship could be a dry one. 2017 is a return to Conway Farms in Lake Forest and it might be the last time the BMW is there for a while. 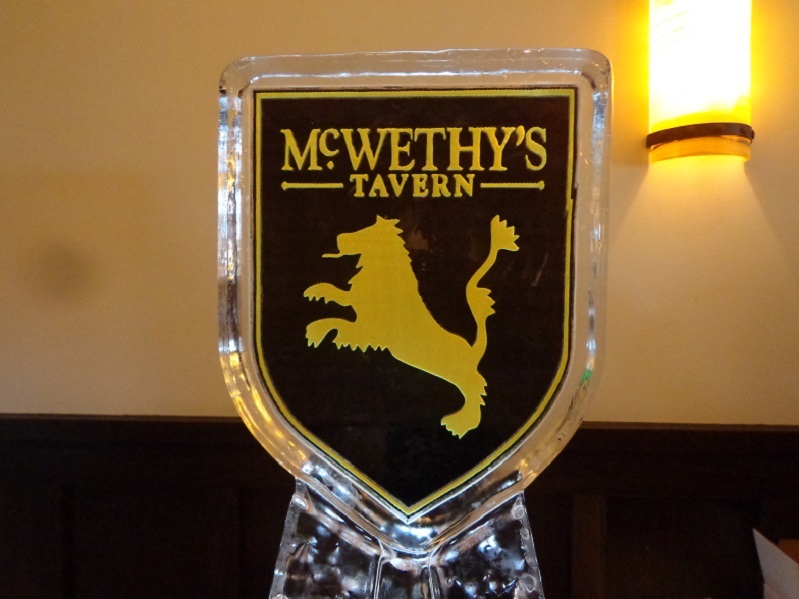 In 2018 the tournament heads to Philadelphia at Aronimink, in 2019 it’s at Medinah Country Club and after that as of now is a ? The BMW contract runs out in 2019 and after Medinah nobody is quite sure yet what the future might be. Whether BMW returns or not, here’s hoping the WGA and the PGA Tour can find more years to play the championship in the Chicago area, kind of like the schedule used by the Barclays Championship that just moved the event around the New York or Northern New Jersey area. Crooked Stick has signed on to be the host of the Western Amateur in 2020, so the championship is not expected to return there in 4 years. I give the WGA and the PGA Tour credit on how they set up the final holes at Crooked Stick, the sky boxes and open area’s made for a nice mix and the spectators seemed to enjoy it.